Songpyeon and Hanboks and Hats, Oh My! 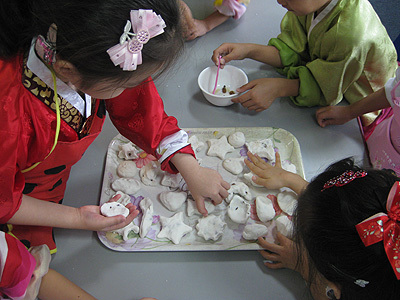 Starting today, Koreans around the country will pack their bags, leave their offices and return to their roots to spend time with their families for Chu Seok, the country’s largest holiday that celebrates the fall equinox. During the holiday, it is common for people to visit the graves of their ancestors, and make wishes to the full moon. My kids and I have been discussing the upcoming festivities at length for days, and when Friday came around, I knew that I wanted my students to make hats that celebrated the season for their craft. 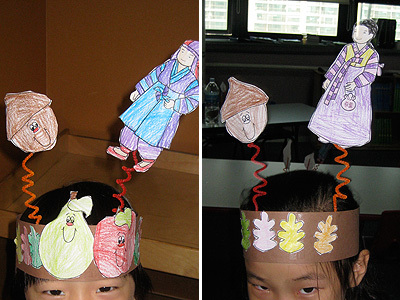 I cut up brown construction paper into strips for the base of their hat, then found pictures of Koreans in hanboks (traditional clothing), fall harvest fruits and leaves for them to color and decorate their hats with. The craft took longer than the time allotted, so I ended up eating lunch with the kiddies to help them finish. When everything was colored, we cut out the pictures and taped them to pipe cleaners to make a sort of antennae-type head gear. 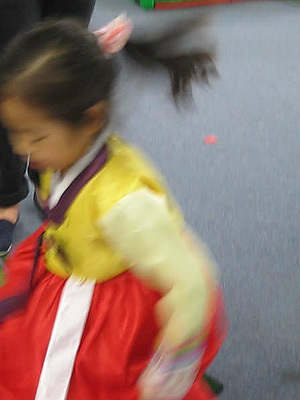 Yesterday, we had a Chu Seok celebration with our kindergarten classes, who all wore their hanboks to school. They looked so precious! 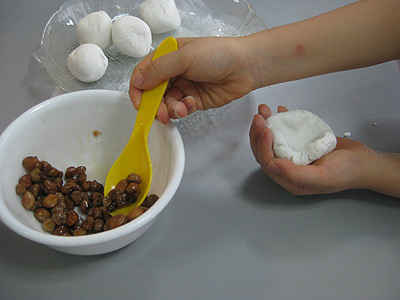 After doing our reading and writing for one hour, each foreign teacher had the opportunity to make songpyeon with their class — traditional rice cakes filled with a variation of sweet fillings, which could be anything from honey and sesame seeds or red bean paste to chestnuts. 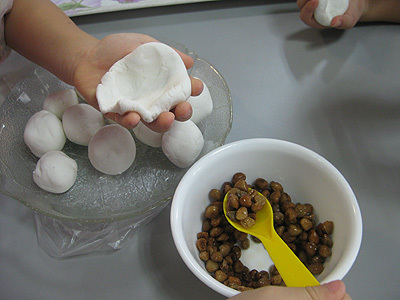 We filled ours with a type of roasted bean, which was delicious, then gently folded them into different shapes. After a lunchtime feast, it was time to play organized games with the children. First, they started by competing in a sort of relay-race, where they had to pop a balloon, crawl through a tunnel, do a somersault, go down a slide, and hop over a series of blocks before the next person on their team could go. Now, this game would have been a little easier had these girls not been in full dresses. 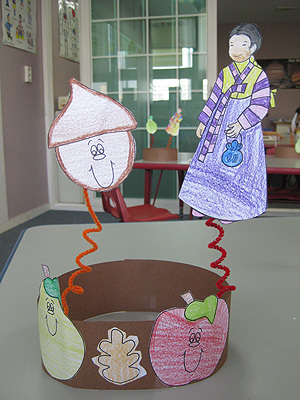 They scurried around the room in their elaborate hanboks, struggling to complete the maze. It was hysterical. After a failed attempt at a sort of hackey-sack game, the kids moved on to “chicken fighting,” which here is basically hopping on one foot, attempting to knock down your opponent who is also on one foot. Of course, we needed to demonstrate just how to do this by “fighting” Greg and Rachel, as the kids screamed in the background. It was like they were watching a UFC match! I wish I could share more of the millions of pictures and videos I took during the celebration, but I would like to keep the children relatively anonymous in the photos, out of respect for their parents.